The beautiful town of Moffat is located in the south of Scotland nestled in the Moffat Hills. Moffat was a spa town in the victorian era visited by rail from all over the UK. It is now promoted as a town of health and well being, attracting tourists for walking in the hills, an abundance of wildlife, good eateries, unique shops and easy access north to Glasgow and Edinburgh, and south to Carlisle and Dumfries. Many people visit Moffat, fall in love with the quality of life and unspoiled surroundings and move there to live. The town benefits from an excellent all-in-one school, good links to commuting towns and cities. The town contains a quality butcher shop, bakery, a variety of local hotels and restaurants which offer local produce, real ales, whisky and live music. There is two theatres, a sports centre, fishery for beginners and professionals, tennis courts, bowling court, putting park with boating pond and professional golf course. A variety of activities occur each year in the town including the Gala week - the crowning of the shepherd and his lass, classic car rallies, agricultural shows, folk weekends and fell running festivals. 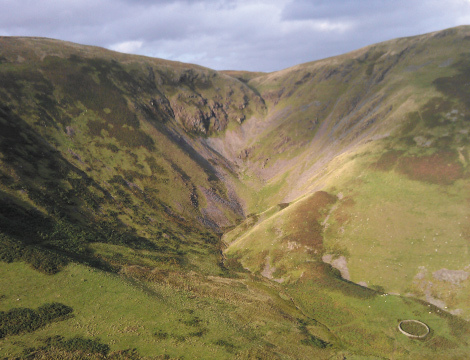 On the outskirts of town is the National Trust for Scotland property - the Grey Mare's Tail, a 300 feet waterfall. The property has Feral goats and Peregrine falcons, and plant fossils can be found nearby. St Mary's Loch, sits just past the waterfall, where you can fish or sail. To the north of Moffat lies another natural feature called the Devils Beeftub, where the Border Reivers stored stolen cattle in a deep natural hollow. Many of the traditional properties in the town are from the victorian era. Hartfell Homes offers quality new homes a short distance from the town centre.